Harry Styles caught a serious case of the cringes when asked about the inspiration behind one of his songs. Nick Grimshaw well and truly stitched up his guest when Harry appeared on the BBC Radio 1 breakfast show, and boy do we love him for it. 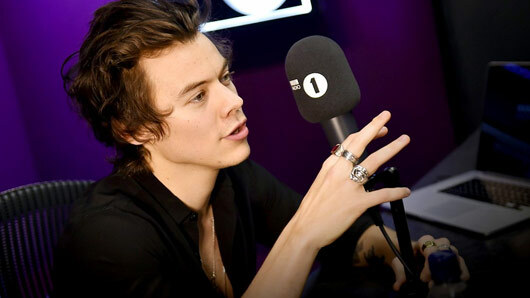 Promoting his debut album as a solo artist, Harry came in to the studio on the release day for a chat with his pal Grimmy. Nick gave Radio 1 listeners a preview of some of the tracks from the former One Direction star’s album, including his new song “Two Ghosts”. It has been suspected the tune refers to Harry’s ex flame Taylor Swift and Grimmy didn’t waste any time on addressing the rumours. Well, we’re gonna go ahead and take that as confirmation that “Two Ghosts” is indeed about Swifty. Nice one, Grimmy.